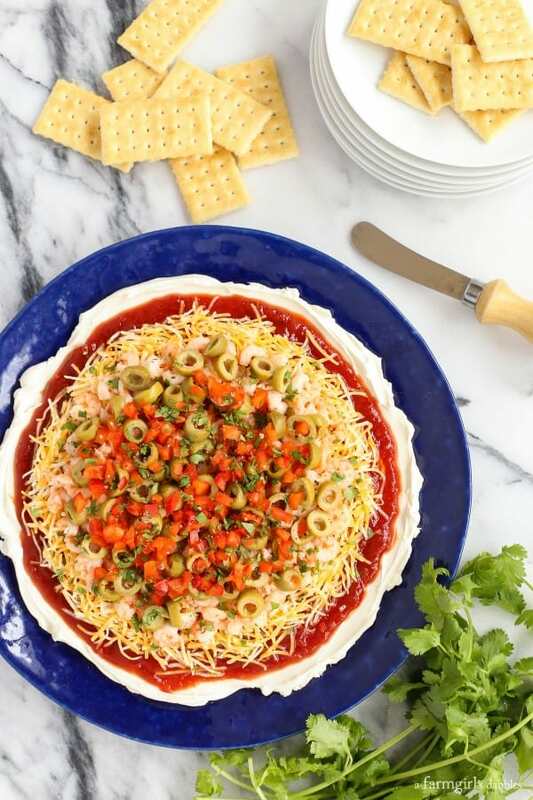 This Layered Creamy Chili Shrimp Dip is fun and pretty, plus all kinds of delicious. Grab your favorite crackers and dig in! My aunt June gets (most of) the credit for this recipe showing up here today. It’s all because of her that my family has been enjoying this dip for basically the span of my entire life here on this earth. 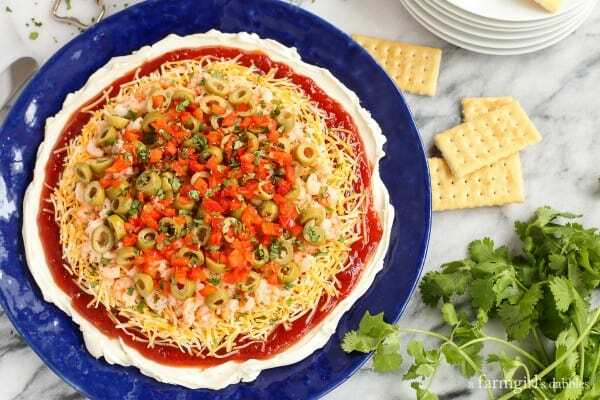 If Ray and June were hosting, we were lickin’ our lips before we ever turned into their driveway, knowing that chili shrimp dip was waiting for us. And the rest of the credit goes to my sister Jessica. While the two of us were enjoying a quiet morning moment together during this past Christmas break, talking about favorite recipes, she mentioned June’s Layered Creamy Chili Shrimp Dip. She said, “Why don’t you share that on your blog? !” And a light bulb went on. Because sometimes the stuff that’s been with us all our lives just seems like regular, normal, everyday “stuff”. When, in fact, it’s really not. It’s actually the most awesome stuff around. I hope you like this as much as my family does! Layering yummy, pretty food is such a fun thing to do. It shows off each and every ingredient, no surprises. June’s recipe does not include the last three ingredients. I just wanted to add a little more color, a little more flavor. Make it however you wish. 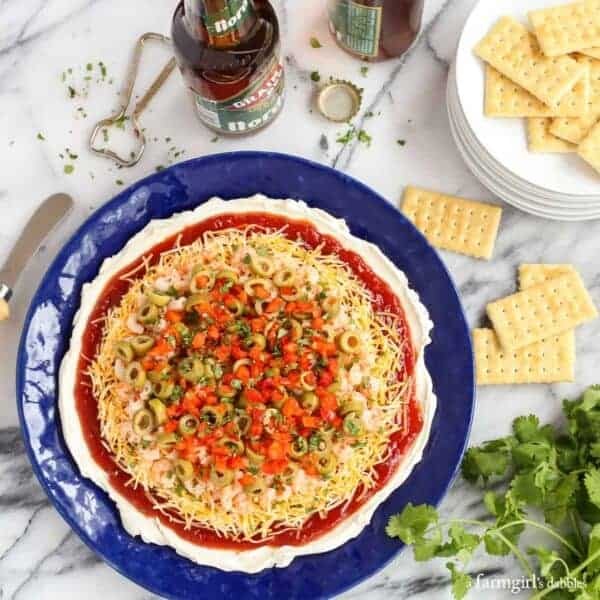 This chili shrimp dip recipe definitely has a retro vibe to it. Which makes me love it even more. 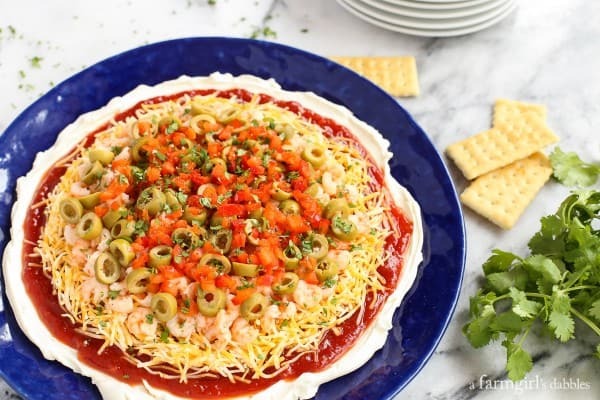 I always think of Christmas when it comes to this appetizer, because that’s mostly when I have enjoyed it in the past. But it would fit in fabulously with any football game or casual gathering. And when constructed on a blue plate, like I’ve shown, that red, white, and blue would offer some pretty awesome snackin’ for the 4th of July. It’s a year-round kind of dish, I tell ya. Spread cream cheese into an even layer on a large plate or small platter. (The plate I used in my pictures is about 11″ wide, and the cream cheese is spread about 9″ across.) Spread the chili sauce on top of the cream cheese, leaving a border of cream cheese showing. 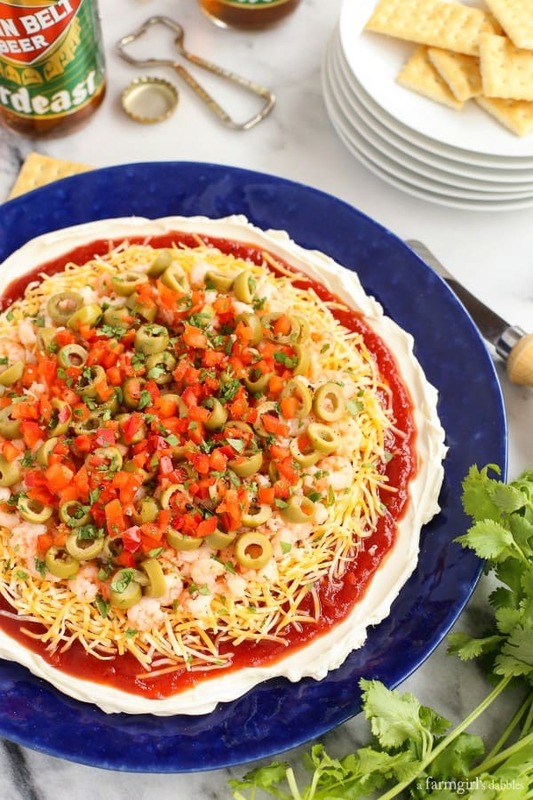 Then place the shredded cheese on the next layer, leaving a border of chili sauce showing. Then add the shrimp, leaving a border of cheese showing. In the final layer, first place the green olives, then the red bell pepper, and cilantro. Sprinkle freshly ground black pepper over the center. Serve immediately. Or June recommends refrigerating for a couple hours to let the flavors mingle. Enjoy with your favorite crackers.